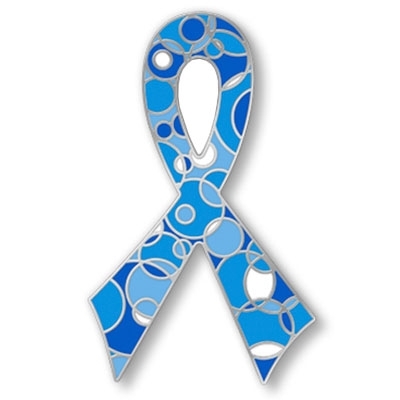 This is one of the many pins available to order in the color blue. These pins represent Prostate and Colon Cancer Awareness. Please note- I have a limited amount of these pins in stock. If you need large quantities for your event or organization, please email me at czinszer@yahoo.com. Arrival time is approximately 4 weeks. Minimum order is 25 pins at $7 each. 50 pins at $6 each. 75 pins at $5 each and 100 pins at $4 each. Please email me at czinszer@yahoo.com for discounts on larger numbers of pins.